Government workers who don’t want to join unions should be able to “opt in” rather than “opt out” of union fees that finance political activism, some California teachers argue. “Unions don’t want people to know how to opt out; they harass you and bully you once you do try,” @4kidsandcountry says. Unless the nation’s highest court prohibits public employee unions from deducting dues and other fees from paychecks without consent, those workers will be forced to help pay for causes they don’t support, according to the teachers, who have filed a federal lawsuit in Los Angeles. Two teachers who are plaintiffs in Yohn v. California Teachers Association described to The Daily Signal how union “opt-out schemes” may be used to dilute any new ruling from the Supreme Court in favor of state government workers who have challenged mandatory union fees under the First Amendment. The teachers argue for the “opt in” approach both in their own case and in a friend-of-the-court brief filed on behalf of Illinois state workers in Janus v. AFSCME, a case now before the Supreme Court. The Daily Signal interviewed Yohn as he and others rallied Feb. 26 outside the Supreme Court on the morning the justices heard oral arguments in Janus v. AFSCME. 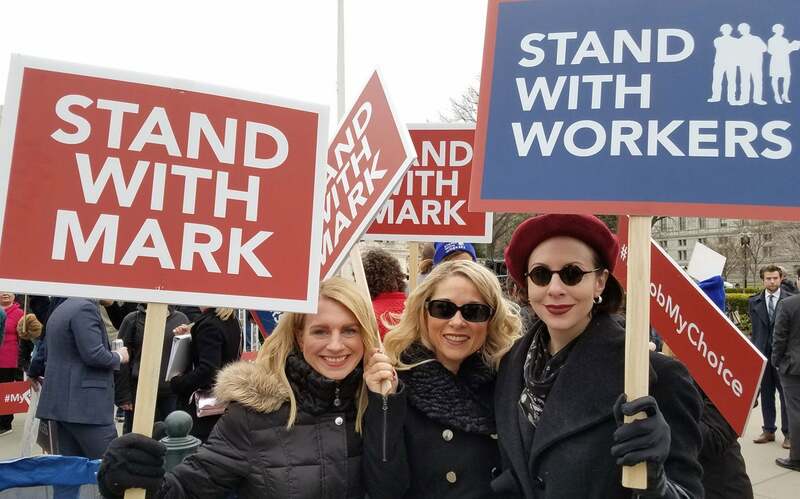 Yohn, a middle school teacher for 13 years for the Westminster School District in Southern California, joined dozens of others who traveled from across the country to express support for Mark Janus, the lead plaintiff in that case. Janus is a child support specialist with the Illinois Department of Healthcare and Family Services. The Janus case challenges the constitutionality of state and local laws requiring government workers to pay “fair share” fees to unions as a condition of employment. Lawyers for Janus and two other Illinois state employees who joined the case are asking the Supreme Court to overturn its 1977 ruling in Abood v. Detroit Board of Education that said public sector workers may be required to pay the fair-share fees, also known as agency fees, if they decline to join a union. In the Abood case, the justices concluded that those who don’t join a union should not be permitted to operate as “free riders” who benefit from collective bargaining on their behalf, and thus should pay fair-share fees. But the ruling also said nonunion workers should not be forced to pay for political activism they don’t support. Yohn’s case on behalf of teachers is modeled after Friedrichs v. California Teachers Association, which made it to the Supreme Court. Because Justice Antonin Scalia unexpectedly died about a month after oral arguments on Jan. 11, 2016, however, the high court wound up deadlocking 4-4. That left a lower court ruling in place that upheld California’s “agency shop” law requiring nonunion workers to pay fair-share fees as a condition of employment. Since the Janus case now before the high court doesn’t address the question of an opt-in arrangement versus an opt-out one, the legal challenge from Yohn and other California teachers could assume a heightened importance, Terry Pell, president of the Center for Individual Rights, told The Daily Signal in a phone interview. If the Supreme Court issues a narrow ruling in Janus that strikes down mandatory union fees without addressing the opt-in/opt-out question, Pell said, public employees such as Yohn could be forced to navigate through lengthy opt-out requests to get refunds for annual fees because of the way contracts are structured. “If that happens, the Yohn case becomes very important and we will get it to the Supreme Court as fast as we can,” Pell said, noting that his group’s friend-of the-court brief in Janus asks for a broad opinion that addresses the opt-out issue. The Center for Individual Rights is a nonprofit, public interest firm based in Washington that represents the Yohn plaintiffs and also represented the Friedrichs plaintiffs. If the Supreme Court rules in favor of Janus and his fellow plaintiffs but leaves opt-out provisions in place, unions could argue that existing contracts require nonunion members to file paperwork seeking refunds for 100 percent of the annual fees rather than just a portion, Pell said. Bruce Aster has been a history and government teacher for 30 years at Carlsbad High School in Carlsbad, California, but has declined to become a member of the California Teachers Association. While he supports his local teachers union, Aster told The Daily Signal, the state and national unions “spend too much time on politics” at the expense of public school employees and their legitimate workplace concerns at the local level. My great hope is that a lot of folks who want to stay involved with their local union would be able to do this without getting involved with the state and national political scene. We all want to stay involved with the nuts and bolts of contract issues that matter to all of us regardless of political affiliation. The big problem we have is with the statewide affiliation, not with the local union, which is less of an overt political organization. The Daily Signal sought comment from the California Teachers Association, which had no responded at publication time. Each year, Aster said, he sends a letter to colleagues at his school advising them of their option to become a nonunion fee payer. His total union fees this year are $1,096; last year, they amounted to $1,059. His rebates on the political portion of the fees in the past 10 years ranged from $317 to $469, Aster said. Leaving the union is a “big hurdle” for many colleagues since it means they lose out on certain benefits, he told The Daily Signal. The Yohn case, currently before the federal district court in Los Angeles, has been stayed pending the outcome of the Janus case at the Supreme Court. Rebecca Friedrichs, who worked for 28 years as an elementary school teacher in the Savanna School District in Anaheim, California, was the lead plaintiff in the Friedrichs case that went to the Supreme Court in 2016. Friedrichs joined nine other teachers and the Christian Educators Association International to sue the California Teachers Association, several local unions, and the National Education Association. Since Friedrichs supports school choice, lower taxes, and traditional marriage, she is typically on the opposite side of public policy questions from union leadership. She filed her own friend-of-the-court brief in the Janus case, arguing in favor of an opt-in system for union fees. While those who don’t belong to the union technically are permitted to get a rebate for the political portion of union fees, the process is “very difficult and very arduous,” Friedrichs said. When you have to opt out, this means everyone is in until individual teachers figure out how to jump through all these hoops. This is not the way it should be. I think the unions should have to make an effort to earn my business. They shouldn’t automatically get my business and then make it difficult for me to get out. Instead, it should be the opposite approach. The union is a tax-free, private organization. As teachers we should be able to decide whether or not we want to opt in. If the unions have a valuable service to offer, let them make their case. Friedrichs said she hopes for a broad ruling in the Janus case. In her court filing, the veteran California teacher says her personal experiences demonstrate that “unions will bully, harass, and isolate workers to prevent them from taking affirmative action to stop subsidizing union political speech.” So, she argues, the Supreme Court should require government employers and unions to acquire the explicit consent of public employees before deducting union dues and fees from their paychecks. 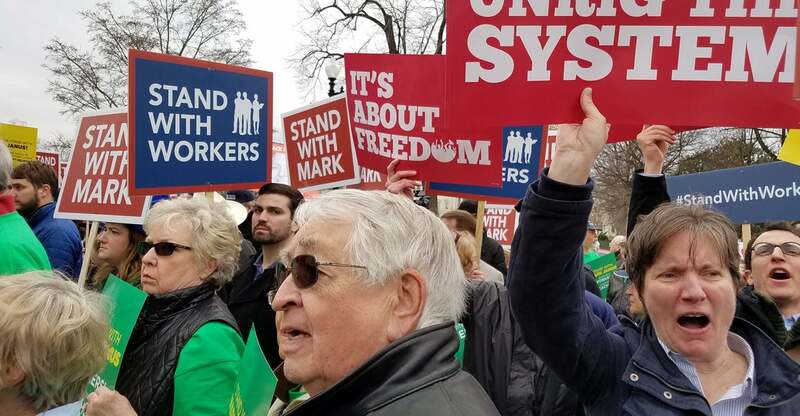 Union members and leaders who spoke with The Daily Signal outside the Supreme Court on the day of oral arguments in Janus said they oppose “free riders,” who they said shouldn’t be permitted to benefit from collective bargaining negotiations without paying union fees. Elizabeth Slattery, a legal fellow with The Heritage Foundation, sees current laws mandating union fees as an assault on the First Amendment. Slattery, who attended the oral arguments in the Janus case, said several exchanges between the opposing sides stood out. In one, she said, a lawyer from the American Federation of State, County and Municipal Employees suggested that if the justices rule against the unions, they should expect labor unrest throughout the country. But in a rebuttal, Bill Messenger, a lawyer with the National Right to Work Foundation, pointed out that the idea that agency fees are the price employees must pay to prevent unions from striking is radical. It’s similar to how the mob operates in demanding protection money, Messenger said. “It’s certainly not an interest the court should accept as a reason to infringe the First Amendment rights of public employees,” Slattery said.